Hot Carter’s Sale: 50% off the entire store + printable coupon! You are here: Home / online shopping / Hot Carter’s Sale: 50% off the entire store + printable coupon! Carter’s is having a HOT sale this weekend! The entire store is 50% off through tomorrow (3/27). This sale is valid in stores and online and the discount is automatic! To sweeten the deal, there is a printable coupon here for 20% off your purchase of $40 or more! (This is for Facebook fans) This coupon is valid in stores only. So, that’s like getting $80 worth of clothing for just $32! If you are shopping online, you can save 20% off a purchase of $50 or more when you enter the code NEWBORN at check-out. It’s like getting $100 worth of clothing for just $40! (NOTE: you can buy any size of clothing and use this code!) If you are shopping online, don’t forget to shop through Shop at Home to get an additional 3% cash back. If you are signing up for the first time here, you will also get a $5 bonus! If you are not familiar with Shop at Home, check out this post here. Shipping is a flat rate of $6. Save 30% off your total purchase at GapKids or BabyGap! Carter’s: Save $10 off a $50 purchase! 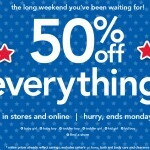 Carter’s: 50% off EVERYTHING plus 20% off and 4% cash back! Carter’s – Save up to 50% off holiday outfits + cash back! 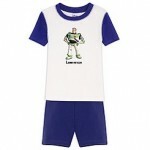 Disney Store: Personalized PJ pals for just $7.99! Carter’s Cyber Monday Sale: 25% off your total purchase + free shipping!